ICC Women T20 World Cup 2009, the inaugural event of Women Twenty20 World, was kicked off on 11th June. The final match of the championship was played on 21st June 2009, with the England team emerging as the winner. The women cricket team of England created history by winning the first ICC Women T20 World Cup, by beating New Zealand with six wickets, in the final match, which was played at Lords, London. 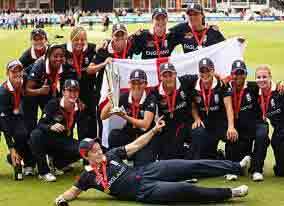 After winning the toss in the final of ICC Women T20 World Cup 2009, England elected to field first. New Zealand played the first innings and ended it with a total of 85 runs only, after playing the complete 20 overs. The top scorer in the team was Amy Satterthwaite, who scored 19 runs. Apart from her, only three other batsmen managed to strike double figures. England fast bowler Katherine Brunt was the star bowler in the innings, who took three wickets by giving just six runs. In the second innings of the final match, England team managed to reach the target in 17 overs only. The star performers of the innings were Claire Taylor, who was unbeaten at 30 runs, and wicket keeper Sarah Taylor, who managed to score 23 runs. With this win, England scored a second victory in 2009, earlier winning ODI World Cup in Australia, in March 2009. English player Katherine Brunt was awarded the 'Player of the Match', while Claire Taylor was awarded the 'Player of the Tournament'.